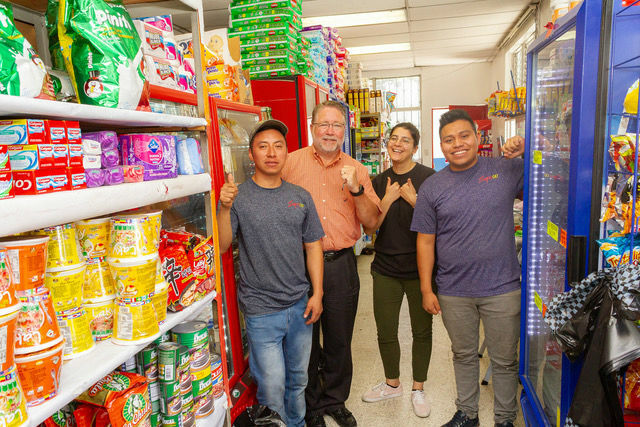 A conversation with Martha Estrada, owner of SuperCo of Guatemala City, and a Bpeace Fast Runner, and Nat Love, a U.S. retail expert and a Bpeace Skillanthropist. Martha Estrada knew she had a solid business, but she needed advice. Enter Nat Love, an experienced retail executive from Grand Rapids, Michigan, who was looking for a meaningful mentorship experience. He was introduced to Bpeace through his role as a GLG Council Member. 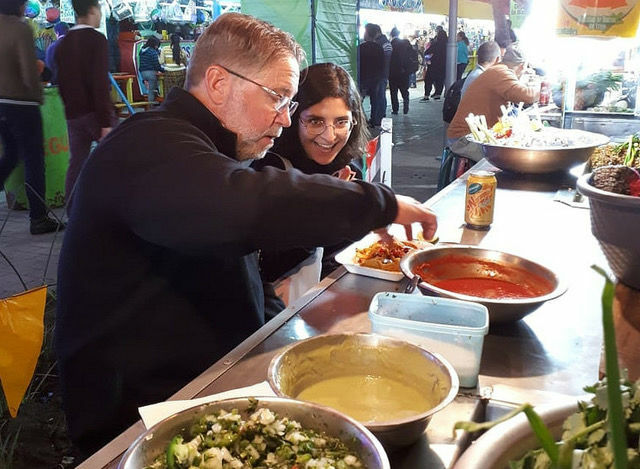 Nat traveled to Guatemala City, where he spent five days working with Martha on her business, SuperCo. The outcome of this collaboration? Martha is now hiring for several new positions with plans to expand beyond her current six locations. SuperCo operates six grocery stores located inside of factories. We provide interest-free credit to factory employees so that they can easily buy the basics. The factories pay me out of the workers’ paychecks. Martha, how does SuperCo serve Guatemalans? My dad was in the textile industry and he noticed that the workers had no time to shop for basic goods. They leave the house at 4:30 in the morning and return home at nine at night. They tend to have lots of kids and little cash. These factories work on products for Nike and Walmart, and these textile workers are an important asset of Guatemala’s economy. SuperCo provides an easy way for workers to purchase basic goods like diapers or milk when they need them, without forcing them into debt. Martha, why did you turn to Bpeace? A friend told me about Bpeace and I applied back in 2015. I was a semi-finalist but I didn’t get it. Then two years passed and I was asked to reapply. My goal was to work with people from the outside with really specific knowledge about my type of business who could help me grow. Martha, how did things go with Skillanthropist Nat Love, who formerly worked as a vice president at Meijer, a chain of superstores in Michigan? Great! Nat has many years of experience in retail. He worked with me for five days, showing me how to maximize the limited space I have in my stores and how to use a variety of models to determine which products are selling better than others. It was great to think creatively with someone from another country. Martha, what are your plans now? Nat taught me that I need to develop people to help run the business; I can’t be the center of the whole operation. I am going to improve SuperCo’s internal processes before I open another store. In addition, I am going to add employees. In most of my stores I only have one or two cashiers. My plan is to add one more cashier in each store and to create an administrative position. I will educate the new admin people to help them learn to do things right. Once we get this down, I will expand. We’ve been on a difficult journey trying to make things right but it’s hard when you don’t have the knowledge. Nat, what do you think you contributed? Retail is similar in all countries. We built assortment models and developed a pricing strategy, reviewed operational things and talked to customers and employees. Martha’s goal now is to get the model down, hone it, and then expand or franchise. In a year, I would expect that Martha would have opened at least a seventh store. Martha, what impact did Bpeace have on you and your business? People here take jobs because they need to not because they want them. Four of our stores are located in the most dangerous areas, known as “red zones.” I want to develop safe spaces and to have a socially responsible business. 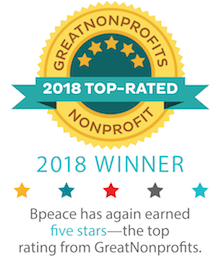 Bpeace is aiming to prevent poverty and violence and that is what I’m trying to do, too. Nat, what did you gain from the experience? It’s always cool to learn about a new culture and Martha’s family treated me like family. We had a lot in common. It wasn’t just work, it was personal. You make a connection and feel really connected to them and now I’m on the sidelines cheering.